Headmaster Collar Accessories provide additional support and comfort. An add-on anterior tube with an extra chin pad gives firm resistance against flexion. The Anterior Support should be removed if the collar is used for transportation. 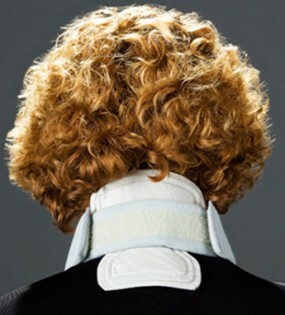 The neck pad provides additional support for the back of the head. 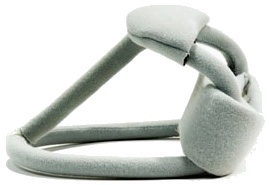 This increases comfort and provides an extra measure of head support in extension. The extension pads provide additional support for the neck and can be positioned for central or more lateral support as needed. This can help with lateral control of the head. The anterior support provides additional support for flexion resistance and gives the collar a firmer vertical dimension. The additional chin pad can be used on the chest portion for extra padding. The collar stands by itself as an excellent support for deficient motor coordination of head and neck muscles, however, there are occasions where headmaster collar accessories add to the function of the collar. Many often inquire regarding an extra chin pad. These are available with the anterior support. The reason is some require the addition of a tube to fortify the flexion resistance of the collar. The anterior support performs this function well, however, it does make the front of the collar more rigid. This requires the addition of a chin pad to ease the strain about the chin. Having an extra chin pad is nice and, if you don’t need the anterior supporting tube to strengthen the front of the collar, you can keep it aside for the future. Hopefully, it will not be necessary, however, in conditions that are progressive, like ALS, it will be good to have it when you need it. Just place the old chin pad aside. Wash it thoroughly and put it aside with the new anterior tube. You will have a fresh new chin pad to use and a the anterior support available should the situation arise. 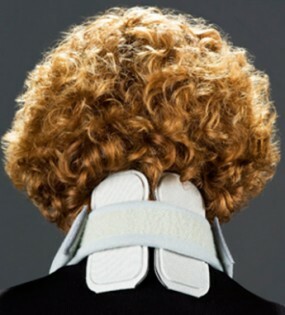 The neck pad is a single padding accessory for the collar which provides a mild amount of extension resistance. This can be helpful if there is a mild lack of control of the head with neck extension. Additionally, it also provides and extra amount of comfort and security in the feel of the collar. If the condition is strictly with drop head and no problem in extension control, the neck pad is not necessary. However, it can provide some extra comfort if in a reclining position against a relatively rigid surface, like some wheelchair headrests. It can also help when traveling or when in unstable motion conditions. It is large, padded and modlable to a degree to increase conformation to body shape. The extension pads are headmaster collar accessories that provide more stability in either extension or lateral flexion. They can be positioned medially and close together, which provides greater extension resistance than the neck pad for moderate extension resistance. By positioning the extension pads laterally, there is increased resistance to lateral flexion. This is important when there is instability with side to side control of the head. Both pads attach by means of a small Velcro strip attached directly to the pads, so it just pushes onto the inside of the strapping for easy installation and adjustments.